Is the problem with the network, the application or the cloud? We answer this question. Intelligent real-time application and service visibility to detect, analyze, remediate and validate operational intent / performance on a multi-tenant cloud delivered platform. Fast deployment delivers predictive actionable insights with crowdsourced benchmarks across users, applications, networks and multi-cloud infrastructures. Understand how you most valuable applications are performing and how your users are experiencing them. Powered by learning from crowd-sourced baselines, Sinefa’s Experience Score starts working right out of the box - no config, no waiting. Fast and seamless deployment provides unprecedented time to value. No desktop or device agents required. When users complain about performance where do you look? Sinefa’s ability to inspect every transaction in the network with a detailed performance lens helps you know where to look next - The network, the app or the cloud. Detailed performance metrics help build visualisations which can be interpreted in seconds by a broad number of personas - Network guys, App guys, CIOs, Devops etc. Push performance intelligence data to other tools or send proactive events to automation platforms like ServiceNow to optimize workflows and respond faster. 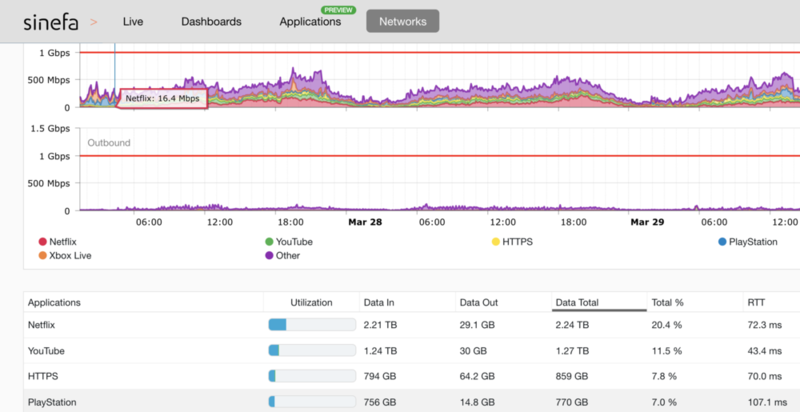 Pervasive and deep traffic insights help you detect performance issues rapidly. Proactive alerting and early detection accelerate resolution times. Remediate performance issues with Application Control and protect the performance of critical application and services. Easy, simple & scalable. The API provides access to Sinefa’s extensive data and the ability to connect Sinefa’s platform with many different cloud and on-premise ecosystem partners. Used by many IT personas in an organization, Sinefa access is easily amongst network, application, cloud, Devops and IT leadership teams. Receive comprehensive reports about the performance of applications, user experience and how that’s trending from week to week. Easy setup and no training required. See everything about your traffic in 1-second resolution. Includes L7 engine with over 10,000 app signatures. Sinefa can run anywhere - Virtual, container, physical, uCPE/NFV. As your organisation and network transforms, Sinefa, we provide the coverage you need to succeed. Sinefa is available in AWS, Azure and GCP to provide performance intelligence for cloud networks and applications. Performance Intelligence made easy - get in touch for a 10 minute demo.